Pamper under-eyes with anti-ageing eye masks that delivers some TLC in just 20 minutes! Beauty Pro EYE THERAPY Under Eye Mask with Collagen & Green Tea has a nourishing formula that minimises the appearance of fine lines, wrinkles, puffiness, under eye shadow and dryness. It also increases elasticity and firmness for a youthful appearance. These eye masks are suitable for all skin types and are infused with collagen and energising ingredients, cut to the shape of the under eye and are ready to use out of the pack. 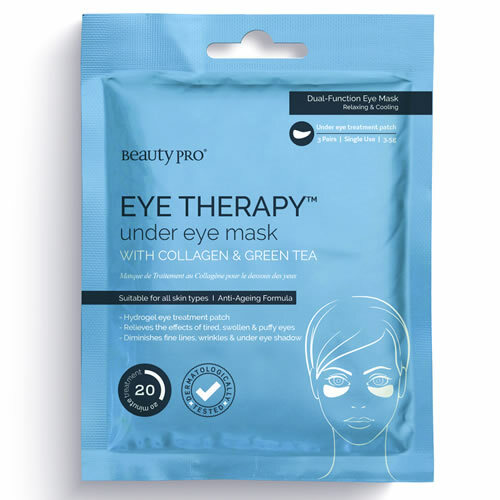 These paraben-free eye masks use marine collagen, combined with key vitamins, herbs and botanicals to relieve the effects of tired, swollen and puffy eyes while targeting under eye shadow. These include Aloe Vera, Vitamin-A, Vitamin-E and Citrus Extracts. As well as long term anti-ageing benefits and improvement to the delicate areas around the eyes, these brilliant masks also diminish the signs of fine lines and wrinkles. Choice of deep cleansing, mess-free clay sheet masks that tighten pores and brighten your clients' complexions. Choose from Purifying or Lifting masks. An effective peel-off mask that rebalances, hydrates and detoxifies skin in one intense 20 minute treatment. It's free of Mineral Oils, Lanolin, Petroleum and Parabens and is available in a sachet or 90-ml tube. Gold or Silver foil-backed masks that use your clients' own body heat to accelerate the ingredients' penetration of their skin. The Gold Mask is great for hydration, nourishing and moisturising, whereas the Silver helps to energise, hydrate and brighten the complexion.